First-person dungeon crawlers have been around for a long time, and like most genres, they’ve evolved over the years in order to find new relevance. Some have stuck to the classic turn-based RPG model and thrown in modern visuals and humour - such as the recent Labyrinth of Refrain: Coven of Dusk - while others have followed the path laid out by the action-RPG and embraced the ways of real-time combat. Haunted Dungeons: Hyakki Castle falls into the latter, offering up a mixture of exploration, basic puzzles and monster battles with a lovely Feudal Japan theme. That Edo Period setting does make for an intriguing source of inspiration, mixing together a tale of warring samurai, exiled sorcerers and the Japanese folklore equivalent of secret agents. With some beautiful Ukiyo-e inspired cutscenes and some creative monster designs, there’s some real potential to be found. With your secret agent squad locked up in the dungeons of a mysterious castle that’s appeared on the exiled island of a typically naughty villain, it’s your job to escape and explore its labyrinthine corridors and rooms in search of said big bad. You can build your team from scratch, selecting from four races (Human, Oni, Tengu and Nekomata) and assign them four familiar archetypal roles (Samurai, Ninja, Sohei and Shinkan). The idea is to build a balanced team, but we often found using three Samurai and a Shinkan provided enough warrior might with a splash of support. You can also just head in with a default squad made of every type, should customising your members in Hyakki Castle’s dry menus become too much. Then it’s down to some good old fashioned dungeon crawling. 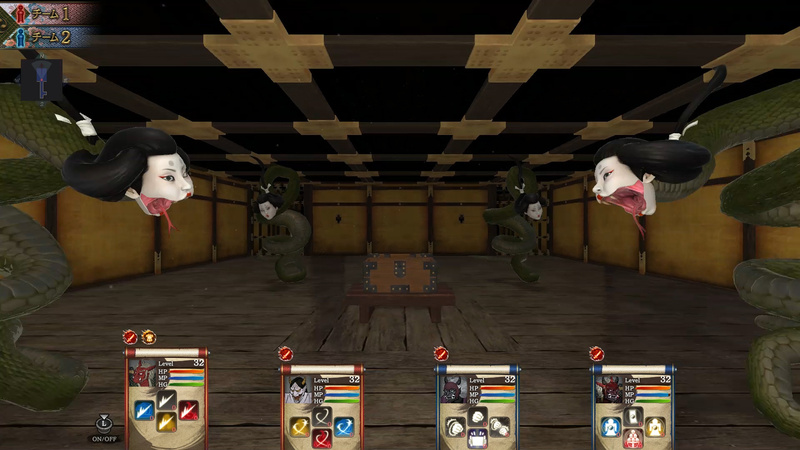 Hyakki Castle’s ‘big’ selling point is the ability to divide your four party members into two teams which can physically split apart and operate separately. Of course, this is no co-op experience so when you press ‘LZ’ one of your teams will be transformed into a giant stone chess piece, while the other can move freely. In terms of puzzle solving, the mechanic tends to extend as far as standing on floor switches to open gates, while in combat it’s more of a means of distracting any enemy. When one team assumes a statue form, their defensive stats are significantly increased, enabling you to use one pair as a fortified distraction while the other flanks the enemy and strikes them from behind for more powerful attacks. You can also use unique skills assigned to each character class, although you’ll need to manage how much spiritual power (MP) you use while keeping an eye on your hunger level (HG). Health (HP) and HG restore over time, but you’ll actively need to eat food found in smashable objects. There’s also a special item called a Zabuton that enables you to restore lots of HP and MP, but it’ll rocket your hunger. While Labyrinth of Refrain often doffed its cap a little too blatantly to the likes of Wizardry and Etrian Odyssey, it at least tried to add a few elements of its own into the mix. However, Hyakki Castle struggles to hide the influence of classics such as Dungeon Master and Eye of the Beholder (or even the more recent Legend of Grimrock). The problem is it never really brings anything new to the table when it comes to any of the mechanics it uses. 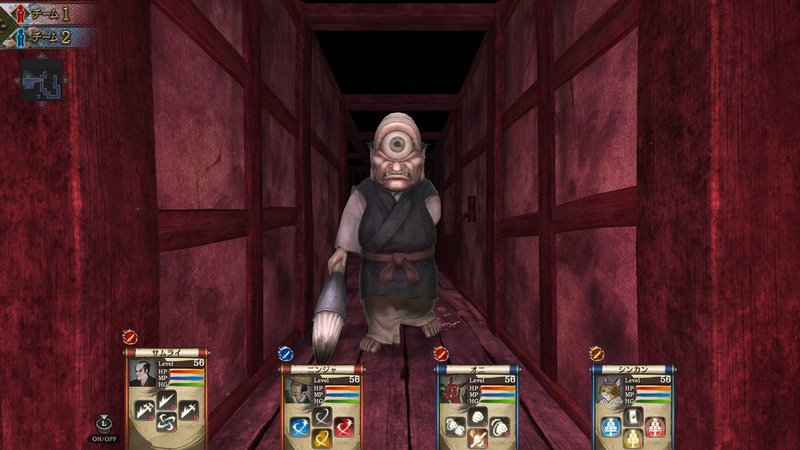 By keeping to that tile-based navigation model you’re limited in the speed and movement you can utilise, so when you go up against a fast-moving yokai with a ranged attack, you’re extremely restricted in your ability to manoeuvre effectively. Labyrinth of Refrain also suffered from dungeons that looked confusingly similar, but managed to balance that out with witty dialogue and a handful of interesting characters. Unfortunately, despite having a really intriguing premise, Hyakki Castle never really takes advantage of it and the simple on-screen slashing as you attack soon becomes an uninspiring bore, even with the ability to switch between all four characters with ‘L’ and ‘R’. To make matters worse, the power to split and merge your characters loses its appeal after you’ve explored yet another maze-like set of cells or chambers, which means the game's one unique mechanic is largely wasted. 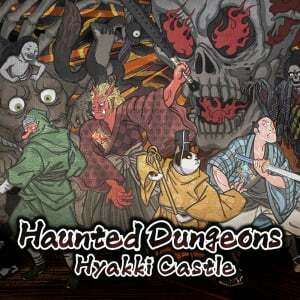 Haunted Dungeons: Hyakki Castle certainly has some interesting elements - most notably its team-splitting mechanic and use of classical Japanese folklore - but thanks to the rigidity of its first-person dungeon crawling design it soon loses steam and you’re left exploring a vast castle full of dangerous yokai and unimaginative level design. It takes plenty of inspiration from those that came before it, but does little to innovate on its own merit. There's a decent trailer on Steam showing the game play for those interested. It scores about 6/10 on Steam. These expanded titles with a hint of the conclusion are a bad idea, as they're just making me skip bothering to open the actual review in most cases. Why not just put the score in the title too? @Jack_Goetz Why not just read it anyway? Unfortunately I received the same vibes when looking through the available photos on the eShop. It didn't look polished enough. Interesting idea, but I unfortunately think I will have to pass on this one.